Buddhism is a very important religion in China and one of the three major schools of thought along with Confucianism and Taoism. It has affected and been affected by Chinese culture, politics, literature and philosophy for almost two millennia. For a more generalized discussion of Chinese religion, see religion in China. The arrival of Buddhism in China followed the first contacts between China and Central Asia which occurred with the opening of the Silk Road in the 2nd century BCE. Chinese murals in the Tarim Basin city of Dunhuang describe the Emperor Han Wudi (156-87 BCE) worshipping Buddhist statues, «golden men brought in 120 BCE by a great Han general in his campaigns against the nomads». However, there is no such mention of Han Wudi worshipping the Buddha in Chinese historical literature. The Hou Hanshu then records the visit of Yuezhi envoys to the Chinese capital in 2 BCE, who gave oral teachings on Buddhist sutras to a student, suggesting that some Yuezhi had already started to disseminate the Buddhist faith in eastern Asia during the 1st century BCE (Baldev Kumar (1973)). «The establishment of the Báimǎ-Sì (White Horse Temple (白馬寺)) by Emperor Ming (58-75 CE) of the Han marked the introduction of Buddhism into China. The temple was located on the south side of the Imperial Drive, three leagues (li) outside the Xiyang Gate. The Emperor dreamt of the golden man sixteen Chinese feet tall, with the aureole of sun and moon radiating from his head and his neck. A «golden god», he was known as Buddha. The emperor dispatched envoys to the Western Regions («遣使向西域求之») in search of the god, and, as a result, acquired Buddhist scriptures and images. At the time, because the scriptures were carried into China on the backs of white horses, White Horse was adopted as the name of the temple.» (Translation: Ulrich Theobald). These Chinese emissaries are said to have visited the country of the Yuezhi (Ch:月氏國), and to have brought back with them two missionnaries named Dharmaraksa (Ch:竺法蘭) and Kasyapa Matanga (Ch:迦葉摩騰) (also called Moton and Chufarlan), together with sutras written with 600,000 Sanskrit words. The two missionnaries wrote “The Sutra of forty-two sections spoken by the Buddha» (四十二章經), to provide guidance on the ideas of Buddhism and the conduct of monks. It is the first Buddhist text in the Chinese language, although its authenticity is a matter of debate. Their arrival in 67 CE marks Buddhism’s official introduction in China. Historians generally agree that by the middle of the 1st century, the religion had penetrated to areas north of the Huai River. At about the same time, King Liu Ying was persecuted and exiled for his religious beliefs. The first documented translation of Buddhist scriptures into Chinese occurs in 148 CE, with the arrival of the Parthian missionary An Shih Kao in China, probably on the heels of the Kushan expansion into the Tarim Basin. An Shi Kao established Buddhist temples in Loyang and organized the translation of Buddhist scriptures into Chinese, testifying to the beginning of a wave of Central Asian Buddhist proselitism that was to last several centuries. Traces of Buddhist iconography can also be seen in works of art from this period. By the end of the second century, a prosperous community had been settled at Pengcheng (modern Xuzhou, Jiangsu). Nevertheless most of the Chinese gentry were indifferent to these Central Asian travelers and their religion. Not only was their religion unknown but much of it seemed alien and amoral to Chinese sensibilities. Concepts such as monasticism and individual spiritual enlightenment directly contradicted the core Confucian principles of family and emperor. Confucianism promoted social stability, order, strong families, and practical living. Chinese officials questioned how a monk’s personal attainment of nirvana benefited the empire. Buddhism was less antithetical to Daoism, the other major religion of China, but at its core Daoism sought harmony with the natural world while Buddhism sought to master the inner world. To thrive in China, Buddhism had to transform itself into a system that could exist within the Chinese way of life. Thus obscure Indian sutras that advocated filial piety became core texts in China. Buddhism was made compatible with ancestor worship and participation in China’s hierarchical system. Works were written arguing that the salvation of an individual was a benefit to that individual’s society and family and monks thus contributed to the greater good. It is conjectured that the shocking collapse of the Han Dynasty in 220 and the resulting period of social upheaval and political unrest known as the Three Kingdoms period may have helped the spread of Buddhism. Buddhism was a minor force, however, compared with Daoism which was directly associated with efforts to defy the emperor (cf. Yellow Turban Rebellion). The Daoist Zhang family self-governed the Hanzhong Commandry for nearly 20 years until invasion by the renowned Chinese warlord Cao Cao. A reason for the lack of interest mostly stemmed from the ruling entity and gentry. All the rulers were Han Chinese and had simply never heard of or knew too little of the religion. The Nine-grade controller system, by which prominent individuals in each local administrative area were given the authority to rank local families and individuals in nine grades according to their potential for government service, further consolidated the importance of Confucianism. Daoism too remained a strong force among the population and philosophers. Subsequent chaotic periods of Sixteen Kingdoms and Southern and Northern Dynasties changed the situation, resulting in state support of Buddhism. Most rulers and population of the Wu, Hu, and the Northern dynasties originated from more than ten distinct ethnic groups including either non-Han Chinese «barbarians», or Han Chinese after generations of «barbarian» influence. They did not propagate nor trust the combined philosophical concept of Confucianism and Daoism as zealously as their rivals in the south. Official support of Buddhism would eventually mould a new Chinese populace with a common ideology out of the diversely ethnic population, which would in turn consolidate these dynasties. It is instructive that Buddhism propagated faster in northern China than in the south. Social upheaval in northern China worked to break down cultural barriers between the elite ruling families and the general populace, in contrast to the south where elite clans and royal families firmly monopolized politics. Daoist and Confucian political ideology had long consolidated the political status of elite clans in the south. Support of another religion would have unknown and possibly adverse effects, for which these clans would not risk their privileges. Furthermore pro-Buddhist policy would not be backed by the bureaucracy, which had been staffed by members of the clans. Southern rulers were in weaker positions to strive for their legitimacy — some were even installed by the clans. It was not until the reign of Emperor Wu of the Liang Dynasty that saw the official support of Buddhism. Rebellion of Hou Jing near the end of Emperor Wu’s reign wreaked havoc on the political and social privileges of the elite clans, which indirectly assisted the spread of Buddhism. But Buddhism spread pretty well in the peasant populace, both in the north and the south. Arrivals of several prestigious monks in the early 5th century also contributed to the propagation of the religion and were welcomed by rulers of the Sixteen Kingdoms and Northern Dynasties. Fo Tu Cheng was entrusted by the tyrant Shi Hu of Later Chao. 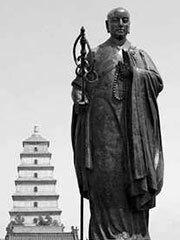 Kumarajiva was invited by Lü Guang, the founder of Later Liang, and later by Yao Xing, second ruler of Later Qin. Biographies of these monks, among others, were the subject of the Memoirs of Eminent Monks. The direct experiential impact of contact with practicing monks should not be underestimated. Confucianism had no equivalent to holy men — the archetypical best and brightest was a wise government minister, not a saint. Daoist priests were more immediate, but given to relativism. It is notable that when another «foreign » religion, Nestorianism, sought to extol the virtues of one of its main benefactors they claimed he was so moral that «..even among the most pure and self-denying of the Buddhists, such excellence was never heard of;» (cf. Nestorian Stele). Through the actions and example of monks, Buddhists successfully laid claim to the high moral ground in society. In this way Buddhism grew to become a major religion in China. By the start of the 6th century, Buddhism had grown in popularity to rival Daoism. We know they were successful because the monks were soon accused of falling into extravagance and their lands and properties confiscated by Emperor Wu of the Northern Zhou dynasty and Wuzong of the Tang Dynasty. During the early Tang dynasty the monk Xuanzang journeyed to Nalanda in India and other important sites to bring back scriptures. He sought to expand influence of Mahayana over Theravada, though the Yogacara school he preferred differs significantly from the later Chinese Mahayana schools that developed such as Pure Land (see Journey to the West). The Tang capital of Chang’an (today’s Xi’an) became an important center for Buddhist thought. From there Buddhism spread to Korea, and Japanese embassies of Kentoshi helped gain footholds in Japan. Buddhist ideology began to merge with Confucianism and Daoism, due in part to the use of existing Chinese philosophical terms in the translation of Buddhist scriptures. Various Confucian scholars of the Song dynasty, including Zhu Xi (wg: Chu Hsi), sought to redefine Confucianism as Neo-Confucianism. The popularization of Buddhism in this period is evident in the many scripture-filled caves and structures surviving today. The Mogao Caves near Dunhuang in Gansu province, the Longmen Grottoes near Luoyang in Henan and the Yungang Grottoes near Datong in Shanxi are the most renowned of the Northern, Sui and Tang Dynasties. The Leshan Giant Buddha, carved out of a hillside in the 8th century during Tang Dynasty and looking down on the confluence of three rivers, is still the largest stone Buddha statue in the world. As a side note, duplications of Buddhist texts were considered to bring meritorious karma. Printing from individually carved wooden blocks, from movable clay type and from movable metal type, proved much more efficient and eventually eclipsed hand copying. The Diamond Sutra of AD 868, a Buddhist scripture discovered in AD 1907 inside the Mogao Caves, was the first dated example of block printing. Today the most popular form of Buddhism in both mainland China and Taiwan is a mix of the Pure Land and Chan school. Its central scripture, the Amitabha Sutra was first brought to China by An Shigao, circa 147, however the school did not become popular until later. It is believed that China is the only country today where all of the branches of Buddhism have significant numbers of followers, since it is the only country with native adherents to all three of the branches of Buddhism. However, Tibetan Buddhism and Theravada Buddhism are largely practiced by ethnic minorities along the geographic fringes of the country. Estimates of the number of Buddhists in China range from 70 million to 150 million.